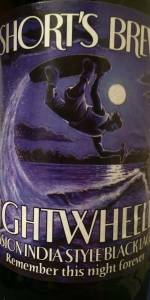 Night Wheeler is a dark black lager with bold roasted malt and faint citrus hop aromas. Robust flavors of burnt cocoa and roasted espresso barely give way to some mild orange and grapefruit hoppiness. Night Wheeler’s light body and crisp nature allows for a showcased bitterness that seems delayed at first, but builds to a powerful finish. Bottle purchased in Short's Summer Variety Pack 2014 on 7/18/2014. Pours a deep and heavy black, enough so that you can not see through the glass. Thin and light head dissipates slowly. Smells of sweet milk chocolate and toasted marshmallow. Slight hint of citrus. Tastes very light and refreshing. Toasted malts come through leaving a very satisfying campfire comfort taste, backed by the very light mouth feel. Hops are apparent at the end and lend a citrus note, but leave a bitter taste. Carbonation is spot on for an easy drinking beer. Overall, very good. The taste defies the style, and the sessionably light 4% ABV lends to supreme drinkability. The hops are a bit more than I would have wanted, but that may mellow some with a bit of shelf life. A sessionable black lager? That's a first for me. $2.29 single bottled a bit ago, on 3/25/14. Poured into a shaker pint. Don't judge. Appearance: Ruby black with a thin layer of brown head. Decent lacing. Looks porter-ish. Quite nice. Smell: I don't know... smells like an old man's breath after he had a banana. Really has a "bad breath" aroma. Weird. Roasted, dirty, muddy smelling, with muddled and almost rotten smelling fruit in the background. Completely baffled. Not enjoying it so far. Gets a little better as it warms, but it's still a combination of the yeast, malt, and hops that's not working for me. Taste/feel: What a huge disappointment. Almost zero body on this one. A little silkiness, but almost drinks just like water, and a pretty light carbonation doesn't help with that. Bitterness is the first thing I notice over flavor, which is just about never a good sign. For flavor, most of it comes through on the finish, and it just tastes like an average black ale that's been watered down. Pleasant roast aftertaste on this one. There's a subtle hop fruitiness and spiciness in there, but the bitterness is the most clear indicator of hops in Night Wheeler. It's never a good thing when a beer's appearance is the best part of it... but that's the case here. I didn't like Bloody Beer by Short's, then again I wasn't really expecting to. This beer is a let down and a bit confusing. Looks good, smells bad, tastes alright, and the mouthfeel needs work. Displeased.